National Youth Music Theatre needs you! Following the huge success of this year’s NYMT commission - The Legend of Sleepy Hollow - at the The Other Palace in London, we’re now fundraising to raise £6,000 to support the production of the cast recording of this original British musical by Eamonn O'Dwyer and Helen Watts. Based on the short story by Washington Irving, this exciting new musical tells of strange events, tales of witches and ghouls, of wailing banshees and headless horsemen, and of course, the tale of the enigmatic outsider, Ichabod Crane. A sense of glowering dread streaks through The Legend of Sleepy Hollow, Helen Watts and Eamonn O'Dwyer’s eerie new musical, commissioned by the National Youth Music Theatre, which premieres at The Other Palace as part of the Company’s residency. Based on Washington Irving's short story of the same name, The Legend of Sleepy Hollow tells the story of a remote farming community in 19th century New England, whose simple lives are disrupted when a new science loving school teacher named Ichabod Crane arrives, and prompts his young to question the god-fearing town’s supernatural beliefs, and paralysing fear of the Hollow Woods’ demonic headless horseman. Alex Sutton directs, teasing out information and foreshadowing, as the mysterious legend of Sleepy Hollow is relayed in flashback form. 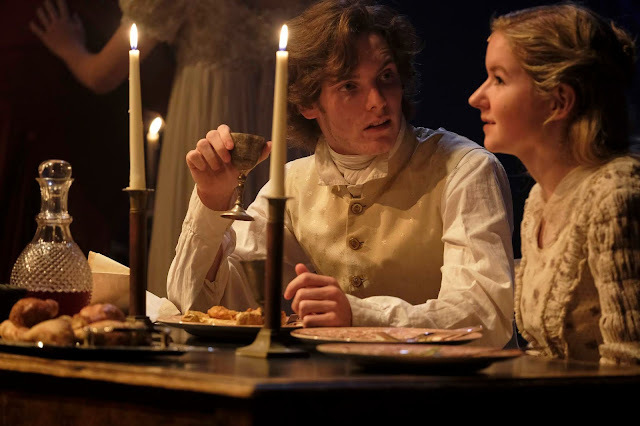 He brings out some incredible performances in the young cast, with George Renshaw bringing both wide-eyed wonder and good humoured scepticism to Crane, and Hayley Canham selling his highborn engaged love interest Katrina’s duality as a reluctant yet dutiful daughter and wife-to-be well. The pair make a sweet couple. Meanwhile, Joe Usher makes a mark as Bron, Katrina’s betrothed who is likable despite his faults, thanks to Usher’s amiable and multidimensional performance. And spectacular in the supporting role of Sabine, a local woman with supernatural gifts who wanders in the Hollow Woods, Jade Oswald is an ethereal vocal revelation. The ensemble, a throng of Sleepy Hollow tenant farmers, are uniformly excellent, adding humour to the otherwise quite solemn proceedings. Music by Eamonn O'Dwyer, masterfully played by musicians of the National Youth Music Theatre, maintains a sense of olde-worlde charm, merged with tense, palpitating uncertainty which is instrumental in maintaining the musical’s creepy atmosphere from start to finish. The orchestrations sound earthy yet luxe, and shine in the musical’s soft, evocative numbers, as well as the jauntier ensemble moments. In particular, upbeat group numbers such as The Tale of Major Andre, where the townspeople attempt to scare Crane with a story about an old English soldier who was hanged, as well as The Tale of the Drunkard Jack, a celebratory number wherein the uncanny history of the jack-o-lantern is shared, provide rare moments of levity, and allow the ensemble to shine vocally too. It’s extremely exciting to see such remarkable new writing on display. The Legend of Sleepy Hollow stirs romance, mystery and horror into a bone chilling broth, and delivers on the mounting terror which is established in its unnerving opening number. Perhaps a bit of slimlining, especially in the first act, would help keep the tension more tightly coiled, resulting in a more dramatic explosion in act two but, even so, by the time the townspeople venture into the Hollow Woods enough anticipation has been built to make the resulting sequence a hair-raising one. The Legend of Sleepy Hollow is an extremely exciting new musical, with a cast of spectacular performers whose careers will undoubtedly continue to rise.